Today is Adam Lambert’s 28th birthday! 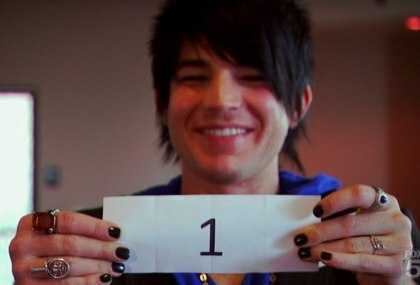 A year ago, Adam Lambert marked his birthday by competing in the early rounds of American Idol. Twelve months later, he’s king of the pop world. Adam, who was runner-up to Kris Allen on Idol, has certainly been a breath of fresh air with his ability to entertain and shock and the best part about it all is he has the talent to back it up. Did he go a little too far at the American Music Awards with his naughty performance? Of course! But the controversy that followed was as interesting as the performance itself. ABC banning him, fans embracing him and his album For Your Entertainment continuing to sell, sell, sell. He may not be selling as many CDs as that other famous TV talent show runner up, Susan Boyle, but Adam seems to be here to stay. Adam paid a visit to The Ellen DeGeneres Show this week – Ellen also had a birthday – and gave an amazing performance of Strut which is the video below. Happy Birthday Adam Lambert! You have been a breath of fresh air since you walked onto American Idol’s stage. Your vocals are beautiful. Your cd is a winner. You have a fun, honest, quick-witted take on the world, and it shines through in your interviews. You are working hard for success, and you absolutely deserve it. Enjoy your special day.